Sinoma-tec vertical mills feature a rational and reliable structure as well as an advanced process that combines drying, grinding, separation and conveying, which is suitable for grinding materials of different types and sizes. A centralized oil circulation system is applied for the lubrication of the roller bearings, which ensures the bearings to run at the most suitable temperature and with clean oil so that a long service life is achieved. A mechanical restraining device prevents friction and collision between rollers and the grinding table. A hybrid separator is used to improve separating efficiency. The hydraulic roller swing-out device provides for ease of maintenance. Low operation pressure of the hydraulic system reduces potential oil leakage and mill vibration, providing for smooth operation and reduced maintenance. A vertical cement mill is used for the finish-grinding of cement. Its grinding table liners and roller sleeves are made from wear-resistant hard facing material or ceramic material. Blades of the separator use high-quality and wear-resistant plates. Thus equipment wear can be minimized, reducing maintenance time and thus increasing availability and overall performance. 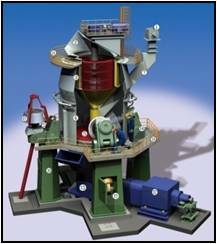 A vertical raw mill is mainly used in cement plants for raw material grinding. Each roller is operated independently in compressing and grinding materials. Thus taking a vertical mill with 4 rollers as an example: when two rollers are retracted, the remaining two in operation can still reach 70% of the rated output. The separator combines highly efficient dynamic and static cages, which provides for high precision in raw meal fineness control and sensitive adjustment of the cut-off point. A vertical slag mill is used for grinding and drying water quenched slag that is generated by blast furnaces into an active material which is then added to the finished cement. Note: Feed moisture <20%, feed size <10mm, final product moisture≤0.5%, final product fineness <4200cm2/g～5000cm2/g, power consumption <33 kWh/t. Vertical coal mills are used for grinding bituminous coal, anthracite and petcoke for the burning systems in clinker burning and power generation according to the type and quantity of additives. Note: Raw coal size 40～50mm, feed moisture ≤15%, final product moisture ≤1.0%, final product finenessR80μm=10%～12% (bituminous coal), R80μm=1%～3%(anthracite), coal grindability HGI=40～70. Vertical limestone mills (or: vertical mills for desulfurization) are used for grinding limestone into powder which will then be used in the desulfurization process in power plants or in the reduction process in metallurgical plants.